George Lamming is an illustrious Caribbean novelist, poet and cultural critic from Barbados. 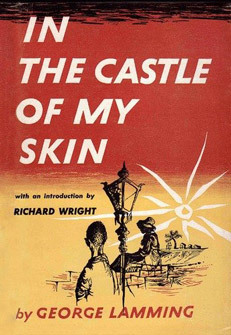 He was just 23 and living in London when he wrote “In the Castle of My Skin.” It draws on his island childhood of mixed African and English parentage, and reflects on post-colonial and neo-colonial questions of identity. The book was a sensation that won the Somerset Maugham Award and was championed by Jean-Paul Sartre and Richard Wright. Lamming was born in Carrington Village, Barbados. He earned a scholarship to Combermere, a distinguished high school where his teacher, Frank Collymore, welcomed the young Lamming into his home library on weekends, and encouraged his reading and writing. Collymore published some of his student’s earliest work in the literary journal Bim. Lamming wrote five more novels and a collection of essays, The Pleasures of Exile, which examines Caribbean politics and race. His poetry and short stories were published in various anthologies. Conversations, a volume of essays and interviews, came out in 1992. Describing himself as “a political novelist,” Lamming is credited – alongside Wilson Harris, V.S. Naipaul, Derek Walcott, Garfield Sobers and others – with making the emergence of a Caribbean identity possible. Lamming depicts the difficulty of cultural identity in this region as a direct result of colonial rule. Lamming began his academic career in 1967 as a writer-in-residence and lecturer in the Creative Arts Centre at the University of the West Indies. He has taught as a visiting professor at Brown University, the University of Texas at Austin and the University of Pennsylvania. He has lectured in Denmark, Tanzania and Australia. Lamming has won a Guggenheim Fellowship and the Langston Hughes Award.